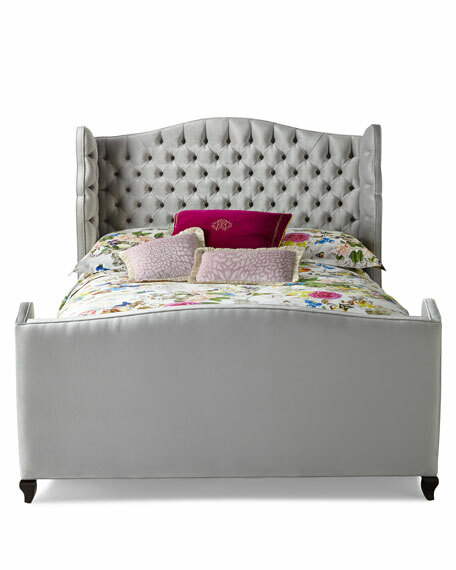 Handcrafted bed with button tufted wing back headboard. Space between where mattress sits and tufting begins on headboard: 16.5"W.
Dacron, upholstery foam, wood glue, upholstery glue, staples, screws, typar. 81.5"W x 96"D x 62"T.
Boxed weight, approximately 427 lbs. 67"W x 100"D x 62"T.
65.5"W x 96"D x 62"T.
Boxed weight, approximately 359 lbs.